of a couple of these. 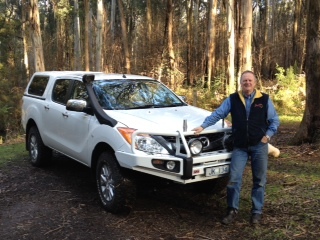 Jim has been training drivers and 4wdrive owners for nearly 30 years, is happily married to Di and has a grown family who also share his love of the great outdoors. Jim’s back ground and current qualifications apart from training and assessing include: fully qualified Motor mechanic, remote First Aid and chainsaw operator and instructor. Clients have included international groups and corporations general public and club members, both here in Australia and overseas. Private schools, corporate groups, universities, private companies, organisations, local governments and national agencies are all customers of SafeTrek. Experience and personalised training in real life natural environments. SafeTrek clients are trained in the natural environment and all training is carried out by a fully qualified, committed and highly experienced instructor. This will lead to continuity of training which will obviously be an advantage to our corporate customers, and also make learning a lot easier for everyone. We are able to instruct to different levels of experience. All participants no matter what skill level will come away from the course with new abilities and an understanding of why this training is important.